New World Library, 9781577314387, 209pp. Most people suffer from some sort of job dissatisfaction. But figuring out whether they should change or their jobs should change isn't easy. From a leading executive coach comes The Authentic Career, perhaps the first book to provide readers with a formal sequence that combines professional, psychological, and spiritual resources to achieve career success and fulfillment. The four-stage process -- clearly outlined and filled with exercises, examples, and inspirational quotes -- has proven successful for the author's clients of all levels, from Fortune 500 CEOs to professional women returning to the workforce after having children. Craddock combines her business background as a Lipper Award-winning fund manager with her training as a social worker and years of experience as an executive coach to outline a therapeutic process that clearly separates what we want and need in order to find fulfillment from the external demands and expectations that family, society, and the workplace impose on us. 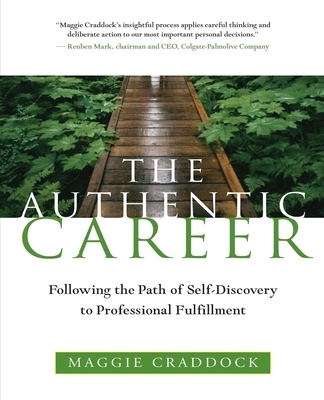 Identifying our authentic career goals and strategies requires that we carefully examine our inner lives, Craddock believes, separating them from the daily demands and frustrations of our work lives.